Chapter 1 of this text introduces the notion of dynamic semantics and discusses, in detail, the phenomena that have been used to motivate it, such as "donkey" sentences and adverbs of quantification. The second chapter explores in greater depth the interpretation of indefinites and issues related to presuppositions of uniqueness and the "E-type strategy." 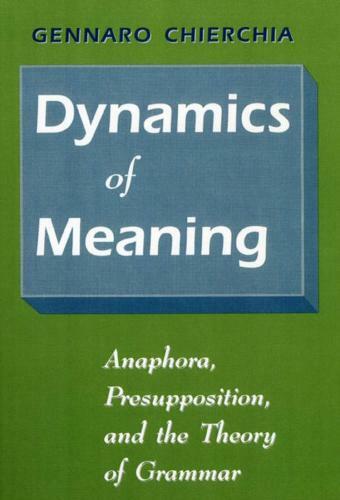 In Chapter 3, Chierchia extends the dynamic approach to the domain of syntactic theory, considering a range of empirical problems that includes backwards anaphora, reconstruction effects and weak crossover. The final chapter develops the formal system of dynamic semantics to deal with central issues of definites and presupposition. Chierchia shows that an approach based on a principled enrichment of the mechanisms dealing with meaning is to be preferred, on empirical grounds, over approaches that depend on an enrichment of the syntactic apparatus.